Below is the video to our current Lista Activa. To download a printable for your classroom, please join the subscription site. 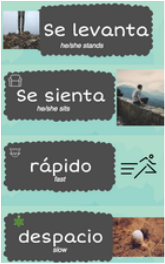 Below you will find videos, games and stories that include this week's Lista Activa words (when available). The below games apply to the first three Lista Activa. Da una vuelta en tu lugar. Turn in your Spot. Lista activa: caminar, parar, comer, saltar.